Oh Ladies, this is a fun challenge, as at first I didn’t think this would be very colorful card. But after finishing it I was really surprised. 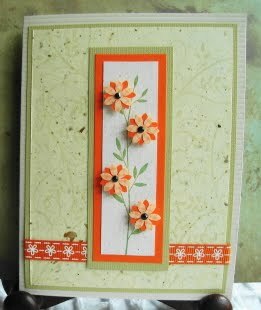 I used Versa-Mark and clear embossing powder to add texture to the printed paper. I wish the scan had been better, as it’s so neat to see in real life. My leaf stamp image is from Hero Arts as is the background stamp. soft orange gingham check pattern paper. One small flower punch was used. Would love to have you come play along with us. Vada, I just love that orange as the bold color! Your layers and background are equally stunning! Beautiful! perfect for our end of summer, so lovely Vada!